James E. Odell, 60, died suddenly Thursday, January 24, 2008 at his residence. Born in Troy, he was the son of the late Albert E. and Catherine E. Banikel. James was a graduate of Catholic Central High School, received his bachelor's degree from Siena College and a master's of science Degree from Union College. He was a systems analyst for Capital District Physicians Health Plan in Albany. He was a veteran of the Vietnam War serving in the U.S. Army. Following his wartime service, he continued his military career with the U.S. Army Reserve, retiring after 20-plus years of service, attaining the rank of Lt. Colonel. He was a recipient of many awards during his service to our country including the Meritorious Service Medal. Jim was a member of the U.S. Army Museum, the New York Army National Guard Museum, a member of the Railroad Association, the Bridge Line Historic Society, and the National Model Railroad Association. Survivors include his aunt, many cousins and numerous friends and acquaintances. Funeral services will be held on Tuesday morning at 10:00 at the Christ Sun of Justice Chapel, Burdette Avenue in Troy. Calling hours will be held on Monday 4:00 p.m. - 8:00 p.m. at the John H. Clinton Funeral Home, Washington Park and Third Street, Troy and at 9:30 a.m. - 10:00 a.m. at Christ Sun of Justice Chapel. Donations may be made to Habitat For Humanity of Rensselaer County, 82 Third Street, Troy, NY 12180. It's a cold October morning in 1984 somewhere in a little town in northern New England. The old engine shop doors are opened, a place where steam once slept. Now the 569, a GP-7, is fired up. As she comes out of the shop into the low morning sun and the crew shows up. After switching the local lumber yard the crew takes a early lunch. Later in the morning the local freight roars into the junction from Portland. I have been bitten by the model railroad bug again, and created a shelf layout. I used a 1x2 frame with a 2" foam base on top. The shelf is 12 foot long, two 6 foot sections bolted together from 24" deep to 16" deep. I used code 83 track from Atlas and used MRC's DCC Prodigy Express for control. I have always wanted to model the fall colors, modeling the B&M, CP, Maine Central along with my own short line the Central Terminal, I'm able to. The "plan" is someday build a layout centered around St Johnsbury, VT in the 80's. Lots of CP Alco's and first and second generation power from the MEC and B&M. I have been inspired by Mike McNamara and Mike Confalone's Fifth-season New England Short Line. So I hope you can see I don't only run this site, I actually do model! The West Waterford Model Railroaders meet Tuesdays at Mark's house. The Crew- Dave, Mark Jr., Fred and Mark Sr. Mark Oliviere sent the first set of photos, of his new layout in his new basement. The track plan is still being developed. Mark will be using the MRC Prodigy Advanced Square to operate the new layout. Turnouts will be controlled from various control panels located on each section of table. The layout has a total of 14 sections, designed as modular units. The table is designed for a minimum of a 100 car freight running on code 100 track with a 32" minimum radius. Framing the tabletop begins. The finished table will cover an area of 290 square feet. A PA-4 locomotive takes an unscheduled break at a railroad tunnel under Fort Ticonderoga on Feb. 8, 1977. 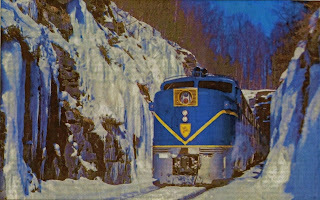 George W. Hockaday, a legend in locomotive circles, was aboard the blue and silver powerhouse and had enough influence to stop the train for a wintry photograph. Longtime Rotterdam resident Hockaday could never become a locomotive engineer because of poor eyesight. But as a revered mechanical engineer, he occasionally got the chance to work in the driver's seat. Here, Hockaday pilots "PA 18," a locomotive that eventually was named in his honor. People who know locomotives still tell stories about George W. Hockaday.That's because George, a revered mechanical engineer, knew locomotives better than anyone.On one run, aboard a locomotive heading toward the Delaware and Hudson Railway's Colonie Shops, the big engine developed electrical problems. Hockaday slipped on some heavy, insulated gloves, opened the high voltage compartment on the cab back wall and reached in with both hands. "Pretty soon," recalled Carl B Sterzing, president of the D&H Railway, "there erupted a huge shower of sparks. For several seconds, it looked like Fourth of July inside that cab, but things eventually calmed down and the engine began running as smooth as a purring cat. "The story is part of "Trackside with 'Mr. Alco,' George W. Hockaday," a new book co-authored by Jim Odell and Len Kilian. Included are tales about Hockaday"s long career as a master mechanical engineer, a man who put the rumble and roar into powerhouses built at Schenectady's former American Locomotive Co. and into engines built and rebuilt around the country.Locomotive buffs will love the words but will also like the pictures — about 300 color photographs, just about all of them taken by Hockaday — are in the large, 128-page book. "We feel we perused more than 10,000 slides to come up with the 300 we have here," said Kilian, a railroad historian who lives in Rotterdam Junction. Kilian and Odell worked on the book for three years. Hockaday, in addition to expertise with fuel pump breakers, injectors, filters and hundreds of other parts, also loved his Kodachrome. He was once president of the Schenectady Photographic Society. His collection of photographs includes shots of vintage locomotives in bright blues, reds and yellows, some in the yards and others in motion on the rails. He got the Laurentian, the Rock Island, New York Central and a Pennsylvania — the mighty "Pennsy" — arid hundreds of others, many of them built by Alco. 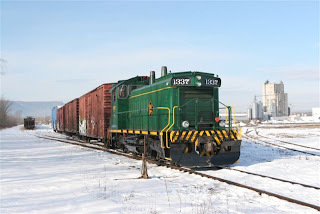 "There's almost a mythological draw or appeal to Alco Locomotives because they're disappearing so fast," Kilian said.Other photos in the book are also rare, like the color scenes Hockaday took in Alco's Schenectady shops. The company didn't like people taking photos inside their buildings, but George built a reputation for clicking away where he really wasn't supposed to.Readers will see stories about Hockaday from the people who knew him. "I remember driving down to the A&M [Arkansas and Missouri] with George," recalls colleague and Alco consultant Chris McDermott. "He brought what seemed like a complete spare parts inventory and a library of publications along with him in the back and trunk of the car. It seemed like he could reach in and find whatever was needed from that supply. "Locomotive fans will learn other things about Hockaday, who died in April 1998 in Sodus (near Rochester) at age 75. "His dream was always to be a regular railroad engineer, as his father and grandfather were, but his eyesight was very poor," Kilian said "He went to work as a mechanical engineer for a railroad in the Midwest, for a little railroad in Indiana called the Monon. That was its unofficial name. He was recruited out of there, in 1956, to come to work for the American Locomotive Co. in Schenectady, where he worked until the company's demise as a mechanical engineer and a customer liaison person. He started to establish this reputation as being 'Mr. Alco' because of the miracles he could create out in the field with recalcitrant locomotives that would not perform. "Hockaday, his wife, Biantha Thompson Hockaday, and sons Warren and Bruce lived in Rotterdam for 30 years. 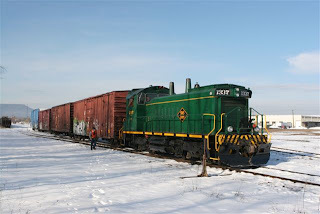 When Alco closed in the late 1960s, Hockaday joined the D&H Railway. The locomotive expert also worked as a consultant. In 1979, he and Biantha moved to Sodus, where Hockaday worked on the new "Ontario Lines. "Biantha, now 85 and living hi Rexford, fondly remembers Me with George. "He was a railroader from start to finish," she said. "That was his entire interest. "Biantha worked with her husband on the consulting jobs. Some days, she would oil parts; other days, she might be on wire harness duty. "Just whatever had to be done," she said. "I'd run the locomotive while he ate his lunch. I mean, there's nothing to it, as special," he said. The timing is right for a book about big engines. The Christmas holidays have long been associated with rails, from people heading home for family gatherings to the familiar scene of a miniature locomotive chugging under a Christmas tree.Kilian understands the fascination. 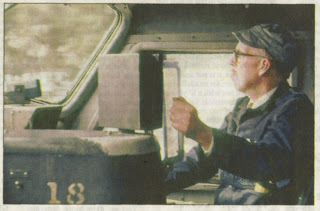 "I think people have an innate love of either the man in the locomotive cab, the engineer who used to wave at them, and still does if you watch CSX," he said. "Or in the olden days, they loved to see the guy in the caboose. The dream of many, many boys and girls was, 'I want to be a locomotive engineer.'" Biantha Hockaday is glad her husband became a railroad man. Even today, locomotives Hockaday worked on are still blowing their whistles, traveling from town to town. "It's nice to know that he lives on in a way," she said. "Trackside with 'Mr. Alco,' George W. Hockaday," is priced at $59.95 and available by contacting Len Kilian at P.O. Box 175, Rotterdam Junction, N.Y., 12150. Shipping is extra. Kilian may also be reached by calling 887-5244. Reach Gazette reporter Jeff Wilkin at 395-3124 or at wilkin@dailygazette.com. SMS Getting ready to head down to Delanson from the Park, 01/08. Hard to believe it was 57 Degrees that day.